When Jed York and 49ers’ braintrust moved it’s headquarters from beloved Candlestick down to a new shiny stadium down in Santa Clara, CA – an hour away from the team’s namesake city – they most likely expected some public outcry. Sure, the new facility would be top notch; but change is hard, and an hour-long drive is an hour-long drive. 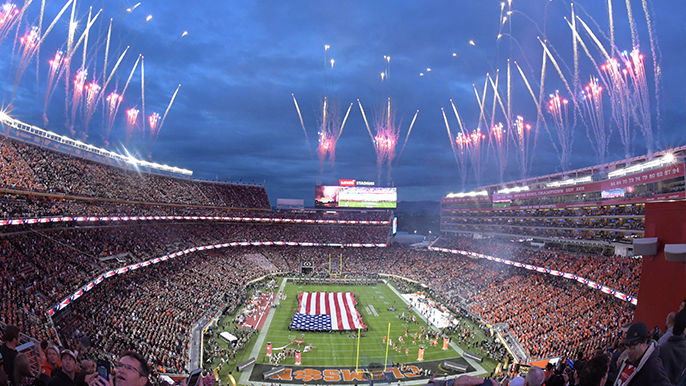 Monday night’s College Football Championship game showed us Jed York’s vision, and what Levi’s Stadium could be if a certain professional team was playing meaningful games heading into the winter months. The fans were loud. The stands were shaking. The field was magnificent. It was easy to move about the area despite a sellout crowd just shy of 75,000. I think tonight’s game was the best event I’ve been to since Levi’s Stadium was built. Great atmosphere, the place dressed up well, and it was easy to get everywhere and anywhere before, during and after the game. Getting fans down to the stadium has been a challenge, but any team with back-to-back-to-back-to-back losing seasons would struggle with the same problem. It’s been the subject of a few empty stadium tweets from time to time, with more empty red seats in attendance than 49ers fans for many 4th quarters over the last few years. First time I’ve ever felt Levi’s shake. The real MVP of this game is the grounds crew! Footing has been terrible at Levi’s stadium for years but hasn’t been an issue tonight. I will say that this is the absolute best this field can probably ever be under these circumstances. And it gets a lot worse when there are other events back-to-back or it's not under CFP or Super Bowl auspices. But I think the 49ers can and will live with it. I think that's OK. I get it, nothing will ever replace Candlestick Park. And moving the 49ers of San Francisco an hour (with no traffic) south to Santa Clara may never win over the diehard fans. But Monday night’s game showed us the good that came out of the team’s move to the South Bay. In a vacuum, Levi’s is a state-of-the art stadium that looks magnificent when dressed up, has the capacity to facilitate extremely large games (and crowds), and gets loud when it’s packed with screaming fans. The problem remains just that – getting those screaming fans in the seats.